I love these! 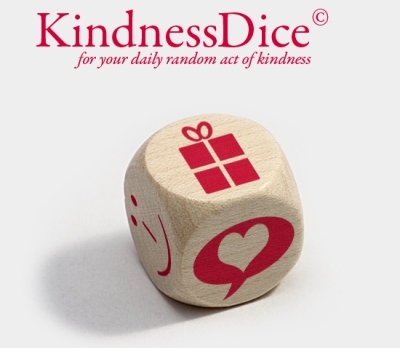 DiceForChange is a concept that aims to change people’s behaviour in a playful way. Roll the dice each day to stimulate changes in your daily routines. Create an awareness of how simple actions can have a greater positive effect on life. These dice are not for sale yet but you can register your interest at the web site, DiceForChange. Check out their EcoDice and WellnessDice too. I’ll be looking forward to these fun dice hitting the marketplace. When I was 13, I was selected by my teacher, Mr. Coates, to be one of two “school printers.” We were presented with a wooden chest full of lead type and an Arab treadle printing press. (These days they wouldn’t allow school kids within a hundred yards of that thing). We learned to set type (backwards, of course) and discovered quads and leading (yes, the real thing not the virtual version). We printed tickets and posters for all of the school events and ate lunch with lead black fingers by the press. I had a wonderful two years gaining printing experience before I was head-hunted by Mr. Lax to be one of his librarians. So now I was sorting books and handling the printed page en masse for the first time. I soon discovered that some book spines couldn’t be read because of some “clever” choice of font. My emotional reactions (small angry ones, in that case) made me take notice. Several years later after I finished school, I joined the family printing business (proudly operating under the name “Graphic Reproductions”). The original logo artwork (which I wish I still had) was set by my dad a few of years before in Letraset “Brush Script.” I remember that choice of typeface being quite a big thing at the time. When I joined in 1974, I already thought it looked old fashioned, but what was the new kid in the business to do? I took over the design of letterheads, business cards, and event cards. As long as the customer and I were happy, all was well. So now I got to experiment… sort of. Of course, customers had their own ideas. Builders liked the blocky fonts, plumbers the bendy ones, and far too many people wanted “Old English.” But it was freedom of sorts. The best times were driving in to Sheffield several times a week to “Andrews Stationery” to select some new sheet of Letraset dry transfer lettering. Everything was hand set in Letraset then, which was a wonderful way to learn about the individual fonts as each curve and edge was burnished down with a spent ballpoint pen. Claremount, Garamond, Univers SF, Arnold Bocklin. I remember Arnold Bocklin seemed to be used all over Sheffield in the late 70’s early 80’s, mostly by plumbers. Then the reign of the “Athena” print and poster stores gave way to the clairity of “Habitat” and “Ikea” furnishings and the style magazines of the day were suddenly crisp and clean and beautiful. Large round typefaces covered pages with tiny fine-line sans serif text tucked tightly below. Wow. This was the future. I saw that the most amazing thing on the page was white space. And the way the type corralled that space could be beautiful. I realised that there was a case to be made for changing a word in a headline purely based on how its shape affected the space around it. Aggressive design; a dangerous path, but impressive if trodden carefully. With the coming of computer-based typesetting, the number of font choices available to us has exploded. Hand scripts in particular are becoming heavily used (and to good effect when chosen carefully). They can be fun, even joyous; yet the best ones are still attractive and well-balanced. Designing a font is no easy matter. Imagine you have 26 characters (besides the numbers and special characters), and these 26 characters must look like they belong beside each other in any order. Tricky. When choosing our font for “odd guy art,” we spent several weeks sampling hundreds of possibilities before settling on “Hasty Pudding,” which we felt not only captured the quirky personality of our designs, but also worked well with our logo’s three closely-set words. The natural inclination of this font visually separates the three words even when we delete the spacing (as in the web address). This made it the perfect choice for us. Inspired by an article at the BBC magazine web site ( http://www.bbc.co.uk/news/magazine-10689931 ). It’s Thursday and we’re busy preparing for our first local show: a display table at a local coffee shop. Marie at work. Groovy shirt! This particular coffee shop is rather cutting-edge for our little town. They hire some great independent musicians as they travel between bigger gigs in Milwaukee and Madison, so we get to hear some wonderful talent without having to travel. (Not that we don’t like to travel. “Road trip” is our middle name). Anyway, tomorrow this coffee shop is hosting a “Bike-In Movie,” with food, live music, and… “odd guy art!” We’re excited. Since we’ll be indoors, we won’t need to purchase a canopy, but we did buy a display rack for our T-shirts. We’ve got a nicely-covered table for our cards and a cool stone pedestal for our hats. We’re working on signs today. Since our business focus is “art,” we’ve continued the theme with a price list that reads like an art gallery price sheet. The magic is in the details. Our goals are these: To make some connections and to sell some merchandise. We’ve only been in business five weeks, but we’re eager to make this happen and frankly it can’t happen soon enough. It’s exciting to finally get out there and introduce the masses to our designs. Fingers crossed. That’s it for now. Back to the drawing board. Marie’s rendition of Leonardo DaVinci’s “The Last Supper” was on display at the Milwaukee Art Museum this week. Here is the photo to prove it. We call this “guerilla exibiting” and it’s a lot of fun. The shirt certainly did get a few interesting looks – or maybe it was the odd guy wearing the shirt that got the looks; it’s hard to tell. I think it was the shirt. 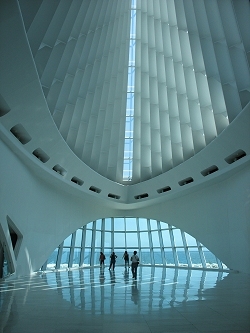 The Milwaukee Art Museum is housed in a stunning building overlooking Lake Michigan. The building’s famous “wings” were wide open that day and made the most amazing sight. The inner space is white on white, reflecting the clear east light from the lake and maintaining its beautiful quality. This building is worth a visit itself even if you don’t have time to venture into the galleries. So here’s a thought: Newspapers sometimes do those cheesy features encouraging readers to submit photos of themselves reading the local paper in odd locales. Guerilla exhibiting goes beyond that. It requires some forward planning, but heck, it’s fun, right? Wanna give it a go? Here’s what to do: Buy an “odd guy art” T-shirt. Then, pick a venue in which to practice guerilla exhibiting. Galleries and museums work well, or anywhere art is displayed*. Then send your photos to us at “art(at)oddguyart(dot)com” (making the usual substitutions in the address there). We will publish a selection of your photos here in the blog, so buy a shirt, go out, and do some “odd guy art” guerilla exhibiting. 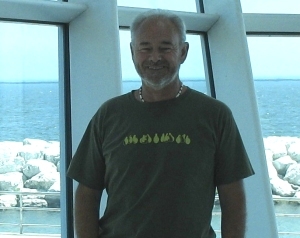 *Don’t photograph anything you shouldn’t – just you in your “odd guy art” T-shirt. We are absolutely not suggesting anything illegal, omg. If you are not sure, take the photo outside of the venue, before or after exhibiting inside. I’m sure everyone out there in T-shirt-design-land has similar stories about how their designs came to fruition, but this one really puts the “fruit” in “fruition.” (*groan*). Several years ago, I painted a watercolor still life called “Last Supper.” All I knew at first when considering the composition was that I wanted to paint pears; they’re so lovely and sensual. As I was playing around with the set-up, the idea to line up the pears like the apostles in the famous DaVinci painting just kind of struck out of nowhere. I headed to the library, checked out a book on DaVinci, and meticulously arranged the pears just so. The Judas pear even has a bruise. Most people do not get the DaVinci comparison at first glance, so if you saw it right away I give you major bonus points. To me, it’s just great fun to see this painting converted to a T-shirt. It’ll get more exposure this way, I hope, and sharing one’s ideas is what art is all about. I studied writing in college, and I recall one particular class entitled “Writing For Media” that taught how to write news releases, radio advertising copy, TV ads, etc. That was 1995. Well, it’s an entirely new world. Of course good writing skills never go out of style, but marketing has changed dramatically with the introduction of the internet. Now that we’ve started our own T-shirt design business, we’ve had to re-learn some basic concepts about marketing in 2010. First, we’ve decided (for now, anyway) that we don’t need a marketing budget. *Shock*. A decade ago, that might have spelled instant failure in the business world, but thanks to the internet and its immediate global reach, we’re able to spread our message for free. Social media outlets like Facebook, LinkedIn, and Twitter are wonderful ways to convey our ideas and meet potential customers. 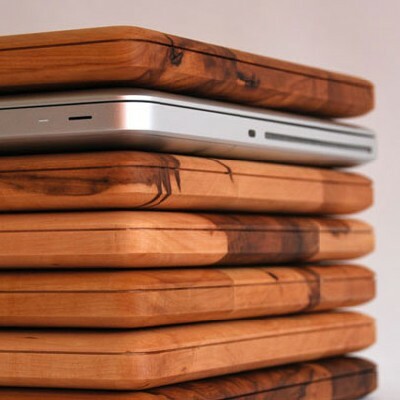 Secondly, there are social bookmarking sites like Digg and StumbleUpon and Delicious. These sites spread your web url to other members in response to the interests they listed upon joining. We joined several of these sites last week, and though we’re still learning how to use them, they seem to be working. (In fact, don’t tell Graham, but I’m secretly addicted to StumbleUpon). We also participate in online forums, which are incredibly helpful online communities of like-minded people willing to share tips and advice about a particular area of interest. For us, the best we’ve found is t-shirtforums.com. We also started this blog (the one you’re reading right now), which is another online vehicle not only for marketing but for sharing information. All of these media, in one way or another, provide an opportunity to market your business. But how do you get your message heard amid the internet’s gazillion others? First, you have to market specifically to your particular audience. This is called “niche marketing.” Who are your potential customers? Identifying your demographic is important. If your business sells, say, hammers for left-handed people, then you have to search the internet for elements of that exact group (and believe me, the internet contains information on some very specific groups. 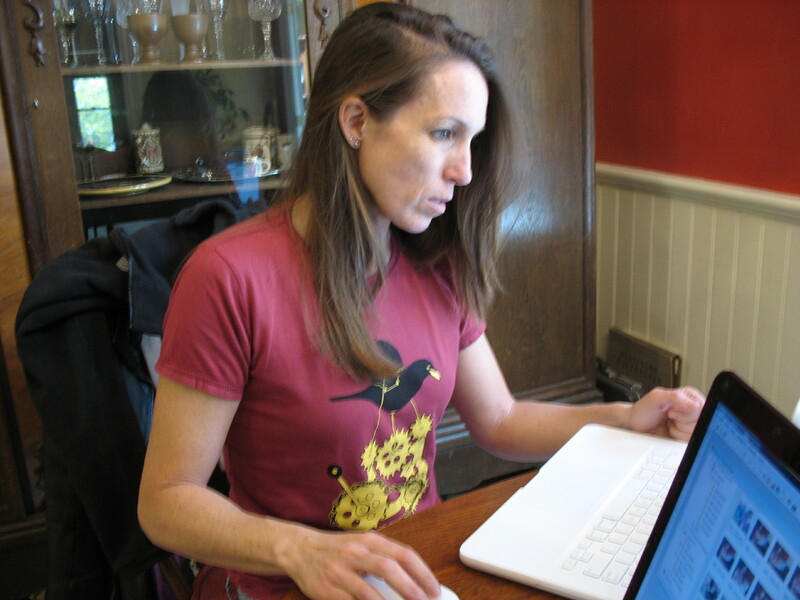 One quick search on blog publisher WordPress yielded 177,588 results for “left-handed”). You also need to find a way to help potential customers solve their problem quickly. When a customer visits your site, the site design should enable him to make his decision rapidly and efficiently, and to enter into the buying cycle with ease. Establish a genuine online persona in order to garner trust and create relationships with potential customers. Just be yourself. Leave status updates on Facebook and let your personality shine through. Write blog posts that not only talk about your products, but help your customers solve their problems and get to know you better. People are more willing to buy things from someone they feel that they know. At this point our business is only three weeks old, so we still have a lot to learn. But teaching a couple of old dogs new tricks is still possible. And, we have to admit, it’s fun.